Sie werden unsere saubere, individuell gestaltete Kabine "Seasons" lieben. Genießen Sie eine schöne Zeit als Familie, kommen Sie mit mehreren Paaren weg oder nutzen Sie die Privatsphäre von 4 Schlafzimmern und 4 Bädern für einen Firmenurlaub. * 8 Gäste finden Komfort in den 4 Schlafzimmern; jeweils mit luxuriösen Queen-Matratzen. * Weitere 1-2 Gäste können sich auf der neuen Ledersofa mit einer verbesserten Schaumstoffmatratze im offenen Loftbereich entspannen. * 4 Bäder; 2 ensuite und 2 günstig neben den Schlafzimmern. Mehrere Sitzbereiche im Innenbereich und 2 Außendecks mit herrlichem Blick auf den Cirque Mountain und das Sundance Resort. Voll ausgestattete Küche mit allem, was Sie brauchen, um zu kochen, servieren und essen mit, einschließlich Grund Backen und Kochen Zutaten. Kabinenunterhaltung umfasst Brettspiele, DVDs für jedes Alter, Fernseher in den meisten Zimmern und WLAN. Sie können sich auch entspannen und den majestätischen Bergblick genießen, während Sie im Whirlpool auf dem Oberdeck sitzen. Dies ist eine in Privatbesitz befindliche Hütte, die nicht Teil des Resorts ist, jedoch eine der näheren Kabinen ist und nur einen kurzen Spaziergang vom Resort entfernt ist. We were at Sundance for a wedding. This property was lovely, with views from every room and bathroom and plenty of space for everyone. The home itself is on a slight hill, and has great light all day. The house had beautiful architectural details and was easy to access as well as close to the resort. I would highly recommend it. This was our second stay. The house is so comfortable and Stunning views. I love this place and the owners are very helpful in making sure we had everything we needed. The location is beautiful and we can’t wait until next time! 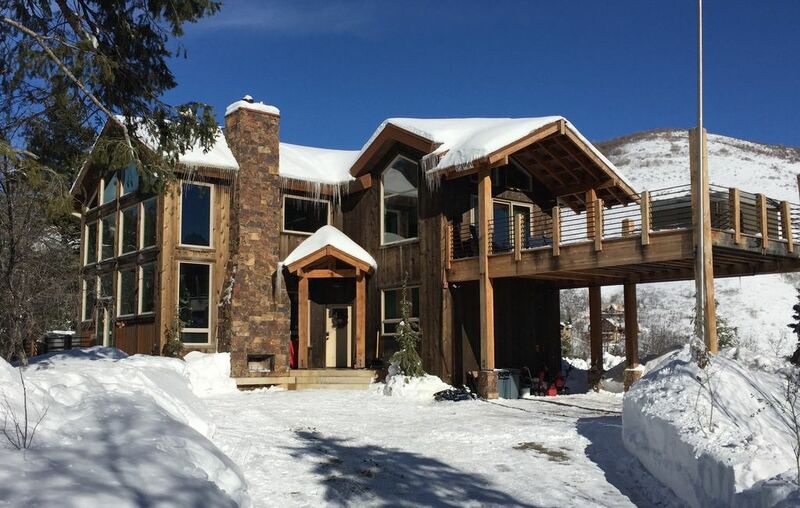 I HIGHLY recommend this cabin to anyone visiting Utah! I could have not asked for a better place to relax. This cabin is beautiful and so cozy! We thoroughly enjoyed our 4 day stay at Seasons in the Sundance Resort. The house was beautiful inside and out and fully equipped for all our needs. The morning mountain views out the front windows and the views of the ski slopes from the deck and hot tub were exquisite. It is an easy walk to the Spa and Lifts, or a short drive down the hill. If you want your accommodations to feel like home, this is a perfect option. We booked this place for a family weekend getaway. We were a little nervous before arriving, hoping that it would be worth it. When we pulled up and then toured the Cabin, we were blown away. It was stunning! It was well stocked with convenient items, very clean, and extremely welcoming & cozy. The interiors have the perfect blend of rustic and modern design. It was just the right size for our family of 9 people. The setting is absolutely gorgeous. The owners were very friendly and accommodating. We will definitely be booking this place again and making it a tradition for our family. Please contact owner about discounted one-night stay options for Non-Holiday Sunday-Wednesday nights.